INNOVEX is currently performing compliance monitoring at 15 properties in King, Snohomish, and Skagit Counties. Groundwater monitoring will assist our client in refining the conceptual site models for each site and demonstrating progress in complying with the Washington State Model Toxics Control Act (MTCA). 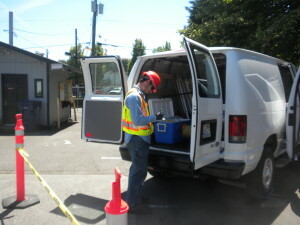 On-site sampling activities use low flow sampling techniques to obtain high quality data. INNOVEX is also performing well inspections and developing well rehabilitation protocols in a proactive effort to improve data quality and reduce uncertainty regarding environmental conditions. At each location, a project-specific health and safety plan, emergency response plan, and work risk assessment tools have been implemented to identify, assess, and mitigate hazards that may impact work activities. INNOVEX operates a behavior based safety system, which includes observation and feedback cards. Staff use these cards to provide leading health and safety indicators, supporting proactive changes to the program. INNOVEX has worked closely with Washington State Department of Ecology to streamline compliance reporting of groundwater monitoring activities. By developing a standard data and high quality graphics template for each property, INNOVEX has reduced reporting costs by up to 50 percent for each property.